Phil Robertson turned to DonationTo when he needed to raise $3,000. Thanks to this choice, he’s able to give over $3,000 to support an important cause. When Phil Robertson was tasked with raising funds for a special cause, he turned to crowdfunding to help him reach his goal. Luckily, the platform DonationTo was available to help him through this process. DonationTo is easier to use as it comes with many features, including how to videos and a community of people ready to donate to a cause. The best feature, though, is the rate, which is $9 to $24 per month. Compared to other crowdfunding platforms, this is a great bargain because they charge a percentage based on the amount earned. A per month fee allows for a better chance of keeping most of the donations raised, while the percentage bites a chunk out of all of the hard work and effort spentraising the funds. In just 138 days, that effort paid off. He was able to meet his goal of $3,000 with an additional $140. He told the story of the cause of the Japanese orphans and why it was important to meet his goal. Overall, his portion will contribute to a bigger fund of 10 million yen which will be met with the help of other members of his cycling group, the Knights in White Lycra. The cause reached 48 DonationTo members who helped him with kind donations and messages of hope. Mirai No Mori and The Knights in White Lycra team up to help 20 kids. In March of 2016, 40 bicyclistS took on a challenging path in the name of charity. The Knights in White Lycra traveled over 550 kilometers from Tokyo to Ichinoseki in northern Japan as a fundraiser for Japan’s orphans. Their cumulative goal was 10 million yen. Through DonationTo and Phil’s efforts, over $3,000 was raised, which was just above his goal. This was more than just a bike-riding event. The money raised by the group will go to Japanese orphans so that they will be able to go to summer camp and also have access to other resources. Growing up in an orphanage can limit children to beneficial opportunities. As they age out of the system, they often turn to a life of crime and could wind up homeless. Thanks to donations and charity events like this one, kids are able to make friends, learn skills and have fun. Hopefully, such an experience will lead to a better future. The Knights in White Lycra have teamed up with the organization Mirai No Mori NPO to help send more children to summer camps. They also offer unique programs and resources year round. While at the camp, kids can learn special skills, including some English lessons, and also engage in outdoor activities. The ultimate goal is to send 20 children, who are residents of Japanese orphanages, to summer camp. They want to extend the opportunity for the next three years so that the children will be guaranteed to have the experience over more than one summer. Their experiences will have a positive and lasting influence on their lives and may foster hope for a better future. In order to accomplish a three-year summer camp experience, it will cost MONEY. Phil used the DonationTo platform to meet his goal of $3,000. He exceeded that amount with $3,140 raised. All proceeds will make sure these awesome kids have an amazing time for the next three summers. In addition to monetary contributions, DonationTo members are encouraged to also give messages of support. Upon reading about the purpose of the fundraiser, a community was built around the cause. These kind people had much to say about the mission that Phil took on with his fellow Knights in White Lycra. They were enthusiastic and supportive with their words, giving the extra boost needed to carry on an important goal. Other community members were also impressed by the amount of time and energy that went towards giving the children three summers of camp. Prem Khana said, “Good job, Phil San. Happy to support your cause.” And Stephen Teal wished Phil good luck and provided a humorous piece of advice. Such words of kindness definitely gave Phil a personal push to achieve the goal as he peddled the path to Ichinoseki, Japan. Summer camp is important because it gives kids a break from everyday life and stressful situations. 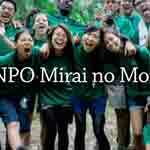 The programs that Mirai No Mori NPO have created have taught kids and gave them a sense of freedom in a beautiful environment. Phil and his team hope to help 20 kids have this enriching experience. In addition to camp, the kids who are part of a care facility will have access to resources essential to their development. As a member of DonationTo, support and fundraising have helped make this possible. DonationTo offers support and resources to those seeking to get the most out of their fundraising efforts. With a fair rate, people like Phil can keep 100% of his donations without worrying about additional fees. The process is easy and a partnership with PayPal and WePay makes the payment system more convenient. We also offer tools, including photo upload and social media integration, to help create a message to reach donors worldwide. Thanks for your contributions. And when you are considering a crowdfunding platform, keep DonationTo in mind.